Bobby had just turned fourteen. Though Rob and I had eagerly anticipated a second reunion, our first glimpse of Bobby was a shock. He had the look of someone who’d been sleeping under a bridge. Even from a distance we could see that his hair was long and shaggy, his posture stooped in an attitude of defeat. Across the trimmed grass he shuffled toward us, expressionless. He hardly looked like our son. Bob Wills lands on the bulls-eye in 1973. Photo by George Uveges from the book. Today (2019) Wills Wing is, as far as I know, the world’s longest established and largest hang glider manufacturer. Its name derives from the Wills family of southern California: Maralys, an author, Rob, a lawyer, and their six children. (Not all six involved themselves in hang gliding.) This book documents how that manufacturing business started and, as the subtitle indicates, the unimaginable distress of a mother having two sons killed in the then new activity of hang gliding. 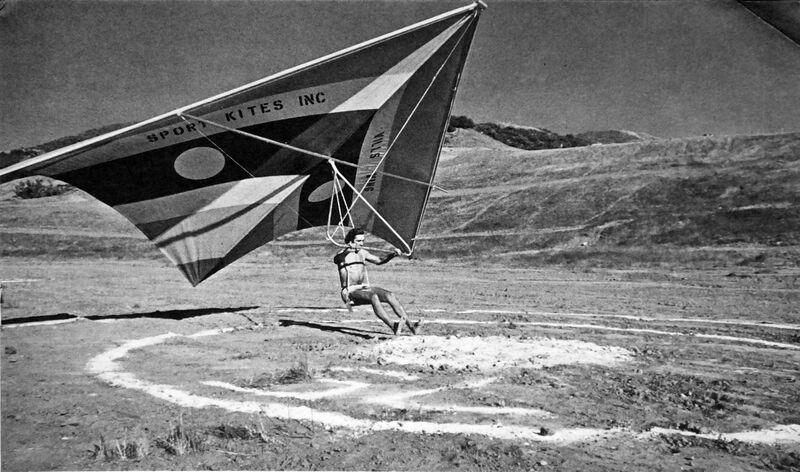 The way that the manufacturing entity Sport Kites Inc (later Wills Wing) was started is not as straight-forward as I had imagined. Unlike the smiling intellectual Chris, tall and lanky Bob with his long face (who suffered from asthma and exhibited associated behavioural problems) lacked direction in life until he discovered hang gliding, in which he had little interest at first. Chris got hold of the February 1972 edition of National Geographic. It featured articles on African wildlife, the varied lifestyles of the citizens of Maryland, the lunar rover adventures of the crew of Apollo 15, and a gathering of men of varied ages floating down a suburban hillside in Southern California while hanging on to home-made Rogallo wings made of bamboo poles taped to polythene sheet sails. By 1973, the two eldest Wills boys, Bob and Chris, together with their friend Chris Price, had designed and built a standard Rogallo refined enough to fly at least as well as the best, and better than most. Yet it was Bob’s skill as a pilot that turned heads of spectators and drew television cameramen, news reporters, and film makers to the windy hillsides where he flew. By the end of the first day he’d made extensive lists and ordered all the tubing, cable, Dacron, nuts, bolts, and tangs we’d need for a month’s production. At meals he told us what he was doing, so full of laughter and enthusiasm he boiled over continually. All of us – even Tracy, Kirk, and Kenny – were caught up in his enthusiasm. The new business was all we talked about, and our conversations went on into the night. You might be surprised to hear that the foregoing is not about Bob. He was at that time away in Canada (winning their championship) when, unknown to him, family and friends set about creating the business as a surprise for Bob upon his return. When he arrived home, he did not react in the way they expected. Maralys’ account of Bob’s first flight from the cliff top at Waimānalo is nerve-wracking. Nobody had flown the ‘green walls’ of Hawaii before. Then, after Bob set the eight-hour record (Chris landed to borrow a jacket, which he gave to Bob by re-launching and passing to him on a line in mid-air) Maralys describes her own flight with Bob, strapped to an extra wide seat suspended by polypropylene rope, but with no back restraint or chest strap. That narrative is so intense I found it hard to keep reading. Then, as now, launching a hang glider in a strong wind really needs a helper on the front wires, especially on a cliff. Eric took a quick look behind him and his eyes got big. Dad was back in action, tying the rope around Eric’s waist, wrapping one end hard around a bush and taking the other end himself. I picked up my kite and moved forward into the wind, trying to make sure Eric was okay. Chris’s launch was not good, but he got away with it – just. 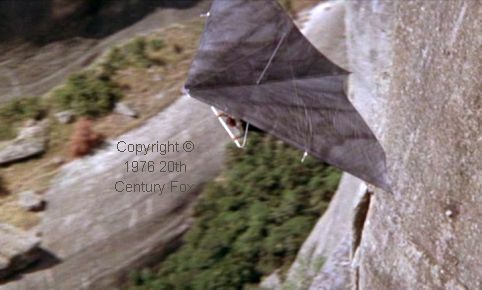 A photo in the book shows him seconds after that take-off, his glider banked towards the cliff with the near half of the sail luffing and Chris weight-shifting the other way, while Eric scrambles up from the cliff edge warily. The parking lot was jammed with cars and RVs, and as we reached the flying site, colored pennants formed into long lines and cheerfully waved at the crowd. Cameras were everywhere: carried by hand, slung around necks, and the oversized variety, bearing the letters NBC, CBS, and ABC, riding sidesaddle on human shoulders. Any new activity that attracts television and press, in addition to drawing in those who push the frontiers and who give more than they take, also attracts sharks. Hang gliding in its early days was no exception. Copying is inevitable. Indeed, copying the most successful designs and advancing on the copy is largely how improvements are made. However, at the extreme are those whose unaccountable malevolence towards the innovators dispirits the latter. The Wills family were victims of such behaviour, as were one or two pioneering British hang glider developers. That was a portent of a disaster yet to come. Our group watched spellbound. Like Mike Larson the year before, Ram lay perfectly still in his canvas cocoon and stretched out the flight. Flying thus, he skimmed slowly, agonizingly, inches above the ground, letting the sail carry him a foot at a time, and finally yards, on what is called “ground effect.” When at last the kite dropped him on his stomach, he’d made the outer ring of the bull’s-eye! As Ram stood up, wrapped in a smile that seemed to involve his whole body, everyone cheered and kept cheering. Ram was so genuinely, gratefully happy he appeared almost shy. Those still among us who remember the British championships held on a range of low hills near the small Wiltshire town of Mere in August 1975 will find Maralys’ account of that competition compelling. Similarly, having seen the 20th Century Fox movie Sky Riders, which the Wills team had just finished flying for before they came to Britain, I was fascinated by the rough treatment they endured to eventually secure the contract to fly for that film. Their superior new glider, the Swallowtail, and their similarly superior flying skills compared to those who were initially front runners for that role, clinched the deal. The book documents how Wills Wing started and the tragedy of Maralys and Rob having two sons killed in the process. If her story described just either one of those two facets, it would be well worth reading: Maralys is a skilled practitioner of the art of conveying emotion by telling a story with just the right words. Chris too is a great writer, whose description of his first ever flight in a bamboo and polythene hang glider had me laughing out loud. 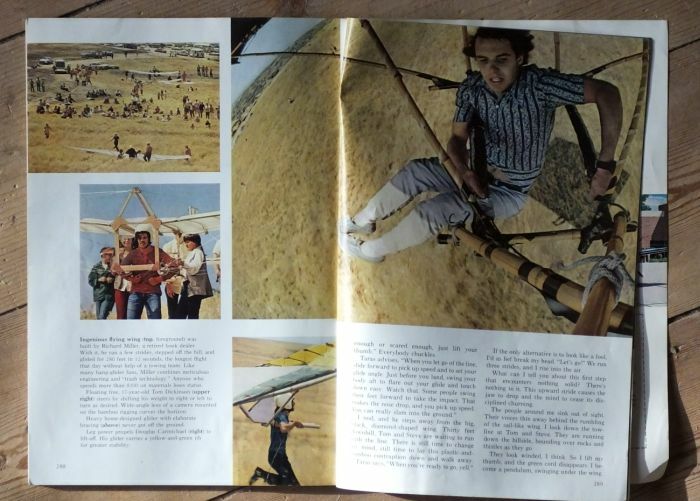 That the book describes both those aspects; historical and emotional in equally compelling language, makes Higher than Eagles essential reading for anyone who wants to understand the origins of modern hang gliding in general and the manufacturer Wills Wing in particular. 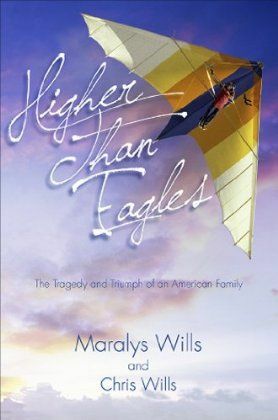 Higher than Eagles, the Tragedy and Triumph of an American Family by Maralys Wills and Chris Wills, 1992, is available in hardback and paperback.